Some recipes need to work harder than others to impress, a beautifully colored spring salad with bright green leaves and vivid red tomatoes is easy to sell to others. Similarly (but at the opposite end of the spectrum) a pizza oozing cheese, topped with pepperoni and a side of chips is always going to go down well. However some dishes just don’t have it that easy. 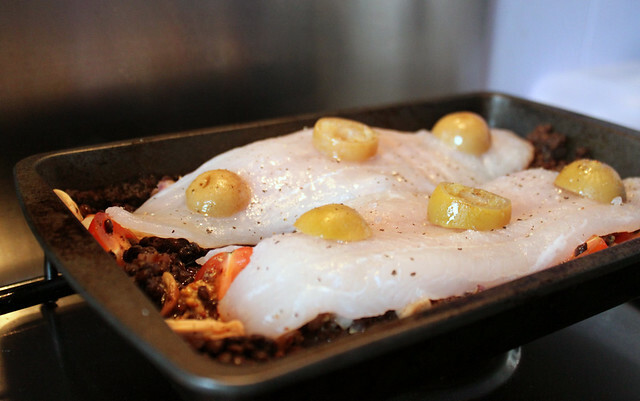 Take this recipe for baked fish and puy lentils, it has fish – but not the covered in batter and fried kind – and brown unappetising lentils. I was full of excitement when I first found the recipe, but as I start to cook it the in-trepidation grows, I’m worried about the response I’ll get from Matt. After I finish taking photos and sit my plate down, I see him with fork in hand but yet to start. The fork hovers over the puy lentils and he says “What does this be?”. “It’s Puy Lentils” and I really want to add, “they’re good for you”, but I am not sure that will help. As I start to eat I feel overcome with relief, it’s amazing! The fish is cooked perfectly and the tangy preserved lemons have just started to seep in. The lentils are not as heavy as they look, they are light and almost creamy, delicately flavoured with mustard and tomatoes. I smile as he finishes and says, “You can make this every week”. 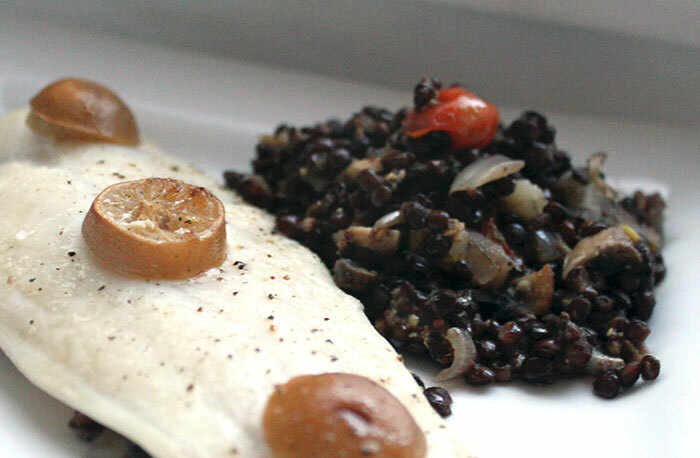 A healthy dish of baked white fish on a bed of mustardy puy lentils, adapted from this recipe. Using a pouch of pre-cooked puy-lentils this takes around 25 minutes. For cooking your own puy lentils, boil them in water for around 15 minutes till soft. 2 tablespoons of oil, I used organic rapeseed oil. 150 grams of puy lentils, I used a pre-cooked pouch. If you want to cook your own use 125 grams. 2 small preserved lemons, sliced and remove seeds. Pre heat your oven to 200oC. In a small roasting pan add 1 tablespoon of oil, turn the hob on to medium, and saute the onion until starting to soften. Add the mushrooms and turn the heat up slightly until starting to colour. Add the lentils, mustard, tomatoes and white wine to the pan and remove from the heat. Stir to coat the lentils in the mustard evenly. Add the fish on top of the lentils, and place the preserved lemons on top of that, drizzle with oil. Season with black pepper and salt before adding to the oven for 15 minutes. Once cooked the fish should be lightly browned and cooked all the way through. Enjoy!